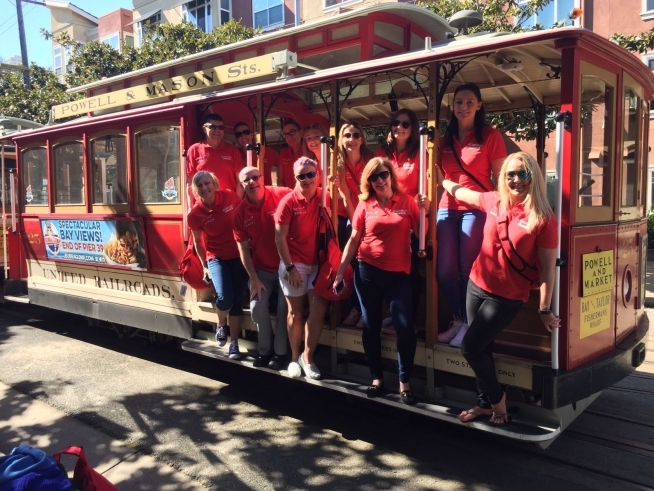 I have just returned from a wonderful Educational trip arranged by Gold Medal and Travel 2, sampling the delights of San Francisco, Los Angeles and Universal Orlando. The new Virgin Atlantic Clubhouse at Heathrow was a fantastic start to the journey ahead. It has a drive through check in facility for those travelling in upper class. The Clubhouse offers a brasserie with A la Carte options, laptop points, a lively bar area, a 'den' for gamers and film buffs and a Spa with complimentary treatments such as facials, manicures and a hair salon. The refreshed Premium Economy cabin on their new Dreamliner was a delight, with mood lighting and an even more comfortable seat on a daily 11 hour flight to San Francisco. A thoroughly enjoyable experience. The Handlery Hotel is situated in Union Square, perfect for shopping and dining, each room is a little different to the other and breakfast is a delight, with a specific menu for our clients, with everything you need to start the day. Perfect for my three night stay. The Cable Car stop is outside which will take you down to Fisherman's Wharf. I would recommend purchasing a Cable Car pass before travelling which will make a great saving. San Fran is a hilly city on the lip of the peninsular surrounded by the Pacific Ocean. If I were to return, I would definitely stay for longer and visit Napa Valley and the areas surrounding the city, there is so much to see and do. I would definitely recommend a cruise around the harbour and of course it is a must to prebook Alcatraz. There are options for a bike ride over the Golden Gate and the hop on/off sightseeing bus which is good value for money. September and October are the best months to visit according to the locals. Fisherman's Wharf is a quieter option with the beautiful sea views and plenty of dining options along Pier 39.. And of course, the famous Sea Lions. Think I left my heart there! In contrast, and only an hour hop on Delta Airlines (very good service indeed) is LA. Just a 15 minute drive from the airport is the lovely harbour of Marina Del Ray and with only a 30 minute walk to Venice Beach makes a perfect stopover. I stayed at The Jamaica Inn Hotel which served the purpose well. There are links into LA City, but perhaps a little too far out of town if you want to see the bright lights of Beverly Hills and Hollywood. I took a bus into Santa Monica with its famous Pier, this is more of a city with a huge beach with plenty to see and do. Delta also fly between LA and Orlando, and this was my final destination of the week. Flying East you cross a few time zones so bear in mind that you lose a day travelling. It is a 5 hour flight. I stayed at The Sapphire Falls, one of the new hotels at Universal. Staying here allows early entrance into the park before the general public, to beat the queues on the most popular rides. Rooms are bright and modern. These hotels have their own complimentary water taxi service directly to Universal, such an easy journey to the park... and return of course. One of the surprises of this trip was our very own VIP tour guide. We had red carpet treatment throughout Universal, skipping the queues and having free reign over our itinerary for the day. This does not come cheap, the guide advised that the cost would be around $5000 to hire him for a group of 10, on top of the entrance price. Perhaps a lottery win might do the trick for that I thought. It would be much more cost effective to upgrade to the next level hotel.....The Royal Pacific, which gives the 'skip of the queue' benefit.